By triggering the development of breakthrough solutions ahead of the rest of the market, public authorities can, through their role of demanding first buyer, create opportunities for companies in Ireland to take international leadership in new markets. By increasing “local” public sector demand to develop innovative solutions for the societal challenges of the future, PCP can help combat delocalisation and encourage companies to invest in highly qualified R&D in Europe. Have you an innovative product or service which the public-sector would benefit from, while the Government could become your first/early customer? 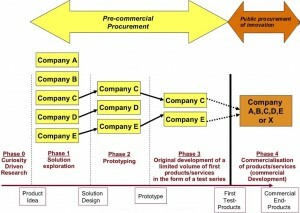 Public procurement of innovation (PPI) occurs when public authorities act as a launch customer for innovative goods or services. Public procurement for innovation has the potential to improve productivity and inclusiveness, if used strategically as targeted, demand-side innovation policies to meet societal needs. For example, it can anticipate future investments to address existing or future societal challenges; or it may allow potential vendors to enter the market with new, innovative goods or services, thus encouraging innovative solutions to pressing challenges. PPI and PCP cover a large range of the industrial market through all development phases – from research to the final stage of the product – giving public buyers the opportunity to influence the market towards innovative solutions. PCP and PPI are separate but complementary procurement processes. PCP/PPI approach delivers significantly higher quality and on average 20% cheaper products compared to long term partnership R&D and deployment contracts that are prone to vendor lock-in. 1. To foster more innovative public procurement procedures and admin capacities. 2. To foster innovation through public procurement – both PCP and PPI. Beneficiaries: public procurers (e.g. open call offering co-financing, best ideas selected = public sector challenges that would generate maximum quality/efficiency improvement for region if solved by innovations). Target group: public sector (improved quality/efficiency) and enterprises (business opportunities). 3. To foster better meeting of public needs through buying the development (PCP) and deployment (PPI) of innovative solutions. Beneficiaries: public procurers such as town planners, transport, environment, health etc. authorities and ministries (ERDF, Cohesion Fund and ESF). Target group: public sector (improved quality/efficiency) and enterprises (business opportunities). 2. AWARENESS RAISING – PROMOTION: inform potential applicants and the final beneficiaries about the available opportunities to achieve better and more innovative results for the public sector through the use of PPP and PPI. 3. IDENTIFICATION OF THE PROJECTS SUITABLE FOR PCP OR PPI: Is important to first identify those projects/investments – or parts of them – for which solutions are already so close-to-the-market that commercial end-solutions could be procured right away via PPI. Secondly, separate out those projects/investments – or parts of the above same projects/investments – that require new and better solutions not yet close-to-the-market for which the R&D could be performed via PCP. 4. IMPLEMENTATION OF PCP AND PPI IN COMPLIANCE WITH THE LEGAL FRAMEWORK:The EU Treaty principles and competition rules must be respected in the implementation of PCPs. As with all other public procurements, PCPs must thus be implemented through transparent, competitive and non-discriminatory procedures. Consider supports from the European Assistance For Innovation Procurement Initiative (EAFIP), who provide free of charge technical and legal assistance to individual procurers to implement PCPs and PPIs.